We participate in a variety of industry events of messaging technologies, online advertising, payment systems, and so on. We will be glad to meet you in person! Schedule meeting with Messaggio! Μessaggio, the high-end messaging platform, attending and sponsoring Malta Telecom Summit, the greatest Mediterranean event of Digital Marketing & Ecommerce, taking place on 11 & 12 June 2018 in Corinthia, St.Julians, Malta. Οur CEO & CTO are glad to have a meeting with you at bilateral table #4 and discuss integrated Βulk Messaging solutions that suits you best! 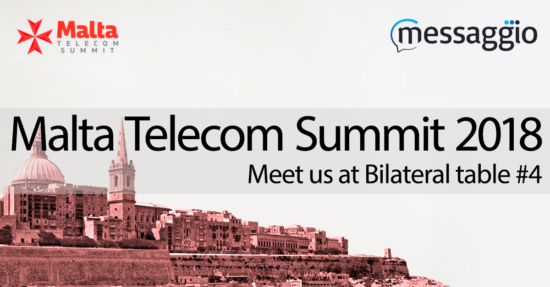 The Malta Telecom Summit focuses on SMS, Voice, Mobile Payments and Applications, we offer the opportunity for Companies and Professionals to develop new business in a relaxed and inviting environment. Didn’t get to catch up with everyone you wanted to during the Barcelona MWC18? MTS is the perfect opportunity to keep the conversation alive with your current partners and rekindle a business opportunity with potential ones. This event is organised by Riwer Corporation the organisers of Wholesale Congress series with more than 10 years of experience on telecommunications business events.